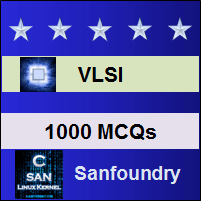 Our 1000+ VLSI questions and answers focuses on all areas of VLSI subject covering 100+ topics in VLSI. These topics are chosen from a collection of most authoritative and best reference books on VLSI. One should spend 1 hour daily for 2-3 months to learn and assimilate VLSI comprehensively. This way of systematic learning will prepare anyone easily towards VLSI interviews, online tests, examinations and certifications. Who should Practice these VLSI Questions? The section contains questions and answers on basic mos transistors, vlsi design, nmos and cmos fabrication and bicmos technology. The section contains questions on nmos, cmos and bicmos inverters, parameters of mos transistors, latch-up in cmos and bicmos logic gates. The section contains questions and answers on stick diagrams and design rules and layouts. The section contains questions on sheet resistance, area capacitance, inverter and propagation delays, drivers, wiring capacitances, mos circuits, differential amplifiers and single stage amplifiers. The section contains questions on mos circuits scaling factors and its limitations. The section contains questions on switch logic, gate and cmos logics, system considerations, clocked sequential circuits and phase locked loops. The section contains questions and answers on design process, design of alu subsystem and multiplier systems. The section contains questions and answers on storage elements, memory cells and flash memory. The section contains questions on optimization of inverters, design styles using cif code and cad tools, floor layout, system delays, simulators, testing, guidelines for testability, lfsr, scan design techniques, cellular automata, test pattern, fault models, testing combinational and sequential logics, pseudo random test pattern and design for testing. The section contains questions and answers on submicron cmos, gallium arsenide, doping process of ga, mesfet, gaas fabrication, device modelling and performance estimation, fet logic inverter, mesfet designs, gaas mesfet logic and fet. The section contains questions on mos transistors, nmos and cmos, mos transistor threshold voltage, noise margin and noises in mos devices. If you would like to learn VLSI thoroughly, you should attempt to work on the complete set of questions and answers mentioned above. It will immensely help anyone trying to crack an exam or an interview. Here’s the list of Best Reference Books in VLSI. Wish you the best in your endeavor to learn and master VLSI!